It is impossible not to be excited about the day ahead, when you open your eyes right here. It is bright. Refreshing. Happy. It is Home. This is my favorite room in our flat. Although considered to be just a “sunroom”, it is now our bedroom. Good call, Catarisanos. Good call. I suppose I’ve always loved the morning. It feels like a new beginning. A start. It is full of anticipation. It is brimming with new joy and hope for beautiful things. It is characterized by sunlight, kisses, and….. I just had to bring it back to food, didn’t I. A little trick to making some perfect French toast is to avoid turning your stove fire up too high. Keep it medium-ish. That way the inside of the bread will not still be mushy when the outside is starting to get burned. Here’s how I prepare my Vanilla Honey French Toast. I use a hearty multigrain bread. Crack eggs in a bowl. Add vanilla extract, honey, cinnamon, and salt. Whisk it together. Whisks are my favorite kitchen tool. Heat up a skillet. Once it is warm, use some oil or butter to avoid sticking. Lay it on the skillet. Flip when one side is done. Once they are on your serving plate, sift some powdered sugar on top to make it look like this. Yumm-ay. Because of the vanilla and honey in this recipe, you can eat these with or without maple syrup. However you prefer! Serve it with fresh fruit, over easy eggs, or turkey bacon. You may think this is weird. Growing up, my parents always served French Toast with a slice of cheddar cheese on the side. I cannot explain why this works – but seriously, try it. 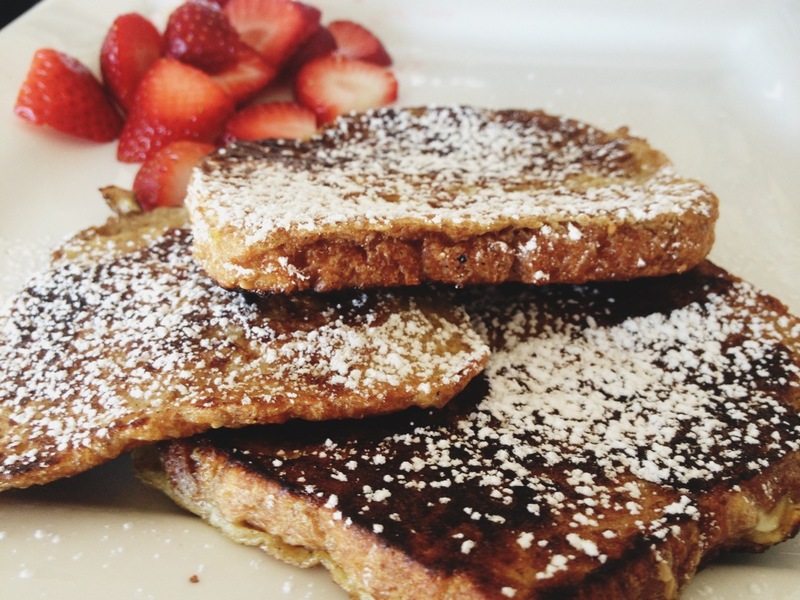 Maple, and French Toast, and Cheddar… Oh my.